After winning the Northwest Division title and earning the third seed in the Western Conference in 2007-08, the Minnesota Wild enter this new season with some new faces. After losing veteran goal scorers Brian Rolston and Pavol Demitra to free agency, Wild General Manager Doug Risebrough knew he had to find a way to replace their leadership and production. Risebrough wasted little time in attempting to fill the void. On the first day of free agency, he lured forward Andrew Brunette away from the Colorado Avalanche. Brunette -- who had 19 goals and 40 assists for the Avs last season -- was a member of the Wild from 2001-04 and ranks third in franchise history with 110 assists. "Andrew is a consistent offensive performer and an excellent teammate who helped create the culture of our team," Risebrough said. "We are better, on the ice and in the dressing room, with him back. Not often do you get the chance to correct a mistake." Five days after landing Brunette, the Wild signed wily veteran Owen Nolan. The 36-year-old, five-time All-Star had 32 points (16 goals, 16 assists) in 77 games for the Calgary Flames last season. The Wild also signed Antti Miettinen, who is coming off a career-high 15 goals with the Dallas Stars. Minnesota also filled a need on defense, as it acquired Marek Zidlicky from the Nashville Predators on July 1 in exchange for forward Ryan Jones and a second-round pick in the 2009 draft. Zidlicky led all Predators' defenseman with 43 points last season. It's always reassuring to know that your goaltender gives you the opportunity to win night in and night out, and that's the feeling the Wild had in 2007-08 and will have again this season. Niklas Backstrom returns for his third season in Minnesota, as he'll hope to at least duplicate the tremendous numbers he put up the first two times out. Backstrom, 30, played in a career-high 58 games last season and went 33-13-8 with a 2.31 goals-against average and a .920 save percentage. As long as he's healthy, Backstrom will handle the No. 1 duties in Minnesota. But that doesn't mean the Wild don't have a capable backup. Josh Harding -- the team's second-round pick in 2002 -- has developed quite nicely and put up adequate numbers last season. In 29 appearances, the 24-year-old went 11-15-2 with a 2.94 GAA and .908 save percentage. He struggled down the stretch of last season (he went 0-5-1 in his last six games), but stopped all 11 shots he saw during his 20 minutes in relief of Backstrom in the Stanley Cup Playoffs. It all begins here with Marian Gaborik, one of the most talented players in the League. 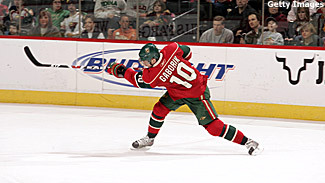 After being limited by injuries for two-straight seasons, Gaborik missed only five games in 2007-08 and led the Wild with 83 points (42 goals, 41 assists). Despite his young age (26), Gaborik has already enjoyed five 30-goal campaigns. It's likely he'll be paired on the top line with play-making center Pierre-Marc Bouchard -- who had 50 assists last season -- and Brunette, who signed with the Wild after three solid campaigns with the Colorado Avalanche. Mikko Koivu -- Minnesota's first selection (No. 6) in the 2001 draft -- returns healthy and eager to contribute in 2008-09. Despite missing close to 30 games due to a leg injury, the 25-year-old still managed to notch 42 points (11 goals, 31 assists) in 57 games. He also boasted a plus-13 rating. Koivu will likely be the team's second-line center, skating alongside Nolan and perhaps 6-foot-3 Benoit Pouliot. The 21-year-old still has a lot to learn, but showed ability to score at the minor-league level. Another player who could have a key role is James Sheppard, who had four goals and 15 assists in his rookie season. Sheppard, who was grabbed in the first round (No. 9) in 2006, impressively made the jump from juniors to the NHL. He had 96 points in 56 games for Cape Breton in the Quebec Major Junior Hockey League in 2006-07, and could be ready to contribute more offense for the Wild this season. Sheppard could be paired with Miettinen, signed as a free agent after scoring 15 goals with the Dallas Stars last season. Other forwards who will have an impact are Erik Belanger (13-24-37), Stephane Veilleux (11 goals last season) and 6-foot-4 Craig Weller, who had 80 penalty minutes. Looking to get more pucks in the net from his blue line, Wild General Manager Doug Risebrough acquired Marc-Andre Bergeron from the Anaheim Ducks on June 10 and Zidlicky from the Nashville Predators on July 1. Both should be extremely beneficial to the Wild's power play. While Zidlicky is more well-rounded, Bergeron has one of the most deadly slap shots in the League. He was tied for sixth in the League last season with eight power-play goals. Bergeron and Zidlicky won't be the Wild's only weapons on the blue line. Brent Burns, 23, is coming off a breakout season that saw him appear in all 82 games while tallying 15 goals and 28 assists. Kim Johnsson also has the ability to create offense and could be paired with stay-at-home defenseman Nick Schultz. Minnesota will have plenty of size on defense between Burns (6-foot-5, 219 pounds), Kurtis Foster (6-foot-5, 220) and Martin Skoula (6-foot-3, 226). Erik Reitz will look to make the full-time roster after five full seasons in AHL Houston. * More weapons on defense. While their own end will always come first as long as Jacques Lemaire is behind the bench, the Wild finally have players who are capable of putting up points from the blue line. With talents such as Marian Gaborik and Pierre-Marc Bouchard up front, Minnesota's power play could be a lot of fun to watch. * Goaltending. The Wild have a tremendous tandem between the pipes with Niklas Backstrom and Josh Harding, who are both capable of stealing a game. Backstrom is one of the League's best and gives Minnesota a chance to win every night. * Marian Gaborik is entering the final year of his contract, so why not reach the 100-point plateau for the first time in his career? With the additions the Wild have made this summer, it's certainly reachable.